Landmark research is shedding new light on the effects of music and sound in relationship to Energy Medicine and Sound Healing. 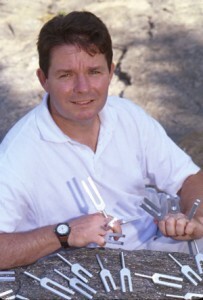 In 2002, Dr. George Stefano and I made an exciting discovery: Specific vibrations transferred to cells using tuning forks causes the spiking of nitric oxide. This release of nitric oxide sets off a cascade of physiological events that directly influences our health, well-being, state of mind, and consciousness. See Sound Therapy Induced Relaxation PDF. Tuning forks spike nitric oxide. Why is that important? In 1998, Robert F Furchgott, Louis J Ingnarro, and Ferid Murad made a discovery which changed medicine. They discovered that our cells produce and release nitric oxide. Their discovery was so important that they won the Nobel Prize in Medicine and so significant that the U.S. government and the pharmaceutical medical complex has spent over two hundred million dollars investigating this gas. Nitric oxide is a molecule created by a nitrogen atom bound to an oxygen atom. It is made in our cells and released into the surrounding tissues as a gas. The release of nitric oxide by our cells is termed “puffing” by scientists to describe the rising and falling of this gas. The puffing cycle is like a wave which takes three minutes to rise and three minutes to fall. See Cyclic nitric oxide release by human granulocytes, and invertebrate ganglia and immunocytes: nano-technological ehhancement of amperometric nitric oxide determination. The rising phase of the wave is the release of nitric oxide which sends a signal to our cells to relax. During the falling phase of the wave nitric oxide dissipates and our cells become more active. The calm between the rising and falling we call still point and we will talk more about its importance in a subsequent article. Our research demonstrates that when BioSonic tuning forks are placed on bone or connective tissue they resonate throughout our whole body in wave like patterns causing the cells to spike nitric oxide. Research further suggests that listening to tuning forks as well as certain music can spike nitric oxide. The implications of this research in both the medical and energy paradigms are profound. The puffing of nitric oxide in our cells is a universal source of health and well-being. New research in the field of sound and biochemistry now shows that tuning forks spike nitric oxide causing our cells to rhythmically puff again. This research opens the doorway for the possibility of a whole new scientific paradigm of music and sound healing for the future. The above referenced BioSonics/Cell Dynamics research used an Otto 128 cps tuning fork which resonates with a proportion called the Golden Mean. Body Tuners creates a similar pulsation. Click here to order a nitric oxide stimulating tuning fork.